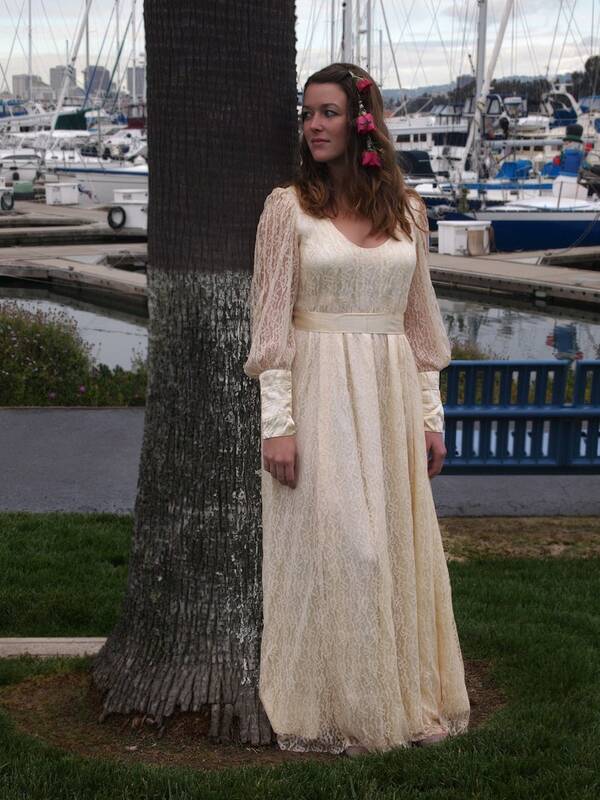 Graceful lace dress that was painstakingly made with pin-tuck details on the bodice, sleeves and cuffs. Two layers, the first is a satin under layer and the second is all lace. It is a champagne color, or darker than cream or ivory, but not yellow or gold, either. I have washed this dress and then steamed it. The dress has been through several soaks and rinses, but still have some left over residue on the inside satin lining. I am 95% convinced that this will come out, but cannot make promises. You cannot see it unless you are in strong light and you look at the satin lining-- the lace does not look dirty at all. There is one small area of a darkening of the lace. I found one very small hole in the lace, as well. These items can only be found when you are going over the dress very carefully. The dress is shown on a size 6 model and it is appropriate for a woman 5'6" or shorter, depending on shoes. Best guess is this dress would fit a 6 to 8. The bust is 36 and the waist and hips are free. There is a sash that comes with the dress. Polyester is a best guess for fabric and there are no labels.